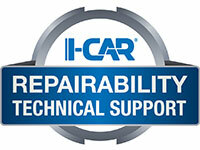 I-CAR and subject matter experts from vehicle makers, collision repairers, insurers, and tool and equipment makers held a meeting in May, to develop, update, and publish an I-CAR best practice on Sectioning A Part In The Same Location Twice. If a previous sectioning joint has been completed at a specific location, that joint location is no longer a viable option for a second sectioning joint. The next available OEM procedure should be selected to complete the repair. The main focus of this Best Practice applies to front and rear rails and reinforcements, however, this also applies to the outer uniside. On an outer uniside, there are often ranges given that would allow a second sectioning joint in the same area general area; just not in the exact same location(s), with consideration given to backing size, if required, for the joint. If the backings would be touching or if the repair joint would have to be made outside of the section range, the next available OEM procedure should be selected to complete the repair.